CAD & 3D Modeling Software for Mac & Windows | Ashlar-Vellum™ Articles. Why is My CAD or 3D Modeling Drawing a Tiny Speck? Home → Support → Articles → Why is My CAD or 3D Modeling Drawing a Tiny Speck? Why is my CAD or 3D Modeling Drawing a Tiny Speck? The procedure to locate and collect this is somewhat different, depending on which program you’re using. With the offending file open, draw a selection box around the speck that is your drawing. Using the Show/Hide dialog box select Hide. Now Zoom All to zoom up on whatever is lurking in the outer edges of the drawing and determine its value. It could be anything from an important parent part from your drawing to a piece of junk that’s seemingly appeared from nowhere. If it is a parent part in Cobalt or Xenon, don’t delete it. Click on the object in the History Tree and you’ll probably see a transform command that was used to boost it into orbit. If it is part in Argon, manually move it back into position. If it is actually junk, just delete it. Now Show All and Zoom All. This should fill your screen with the known drawing. If your drawing is still a speck, repeat the process one or more times, deleting or moving things that have flown to the outer quarters of the drawing space. 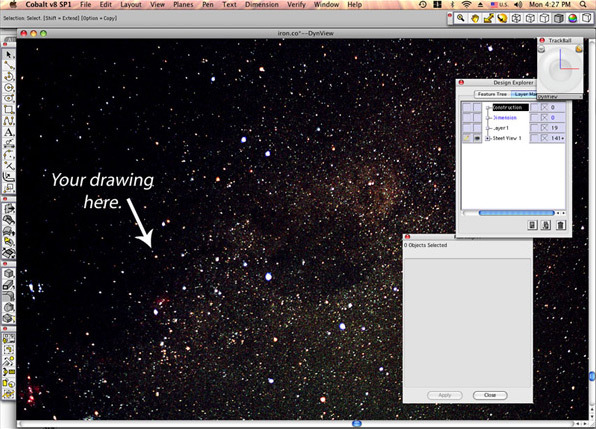 Working with a COPY of the drawing, delete the speck in the center of the drawing universe. Then you’ll need to find the relative coordinates of the offending junk or stray parts by zooming up on each of the four quadrants of the drawing area. When you’ve located these and noted their whereabouts, open your original drawing and delete the junk or move the parts back into position.